Vice President and Prime Minister of the UAE and Ruler of Dubai His Highness Sheikh Mohammed bin Rashid Al Maktoum announced the launch of the national campaign ‘Let’s Preserve the Legacy’ and extended an open invitation to the community to contribute historical items to the Etihad Museum, which will be officially inaugurated during the UAE National Day celebrations in December later this year. His Highness Sheikh Mohammed bin Rashid Al Maktoum emphasised that history is the most valuable treasure that we have, and our commitment to our country obliges all community members to participate in this initiative. In doing so, a valuable contribution will be made towards maintaining and preserving the UAE’s historical legacy. This will, in turn, inspire future generations to continue building what our founding fathers started when they established the foundations of our nation. Through a unique visitor journey, Etihad Museum presents experience-driven exhibitions that include interactive educational programmes and exhibits that explore the chronology of events that culminated in the formation of the Union of the UAE in 1971, with a key emphasis on the period between 1968 and 1974. Through interactive exhibits and learning programmes, the museum tells the story of the Union’s creation from the perspective of the country’s leaders. 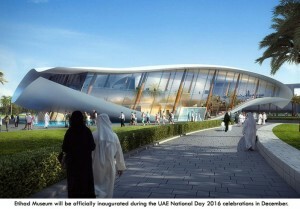 ‘Let’s Preserve the Legacy’ campaign, which is managed by Dubai Culture, encourages all members of the UAE community to donate items which relate to the Union of the United Arab Emirates in 1971 – to be displayed in the Etihad Museum after its official inauguration during the UAE National Day celebrations. The campaign is open to all members of the community, and will accept contributions in the form of historical photos and items related to the Union of the United Arab Emirates in 1971. Individuals and institutions can express their interest in contributing items by contacting Dubai Culture on Etihad.museum@dubaiculture.ae or (www.etihadmuseum.ae), 04-5155159. Individuals who are interested in contributing items to support the Etihad Museum collection will be required to provide their contact information and details that identify items as an individual object or part of a series, a historical object, photograph, or media recording. The selection committee also requests a more detailed description including the item’s relevance to the Union and/or the historical events between 1968 and 1974, the approximate dimensions, the date it was made, the history of how it was made or used, and any other relevant details. High quality photographs should accompany each submission. Through a unique visitor journey, Etihad Museum will present experience-driven exhibitions that explore the chronology of events that culminated in the formation of the Union of the UAE in 1971, with a key emphasis on the period between 1968 and 1974. Through interactive exhibits and learning programmes, the museum tells the story of the Union’s creation from the perspective of the country’s leaders. The experience also aims to educate visitors about the nation’s constitution, in particular the rights, privileges and responsibilities that it bestows upon the people of the UAE. Dubai Culture is responsible for managing and supervising all of Dubai’s museum and heritage sites, as well as preserving their historical and cultural significance. Furthermore, the Authority oversees the museums’ daily operations, and the development of educational initiatives to enhance the learning experience. For this flagship UAE project, the Authority is responsible for the day-to-day management of the museum, the development of educational programmes, and the curation of permanent and temporary exhibitions.